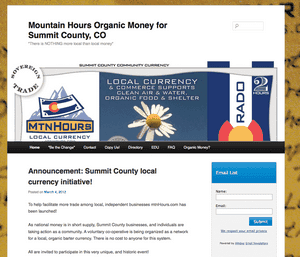 A new network of currency measured in hours, not dollars, has landed in Summit County. The idea behind Mountain Hours is that people are the money, said Wayne Walton, one of the four creators, or “revolutionaries” of Summit's new system. Here's how it works: one “mtnhour” is equal to $10 (There are four denominations: 1/10 hour, 1/2, 1 and 2). Local business owners agree to accept the currency, and are given 200 mtnhours right off the bat. The hours are then used at other businesses around Summit that accept the currency, thus encouraging local spending and keeping everything within the county. The money is debt and interest-free, Walton said. Once people realize they are the money, they can have abundance, Walton said. In only five weeks of operation, Walton has 34 businesses signed up. Every one that signs on gets its initial allocation of hours — and another every three months — and a marketing video, which is displayed on the mtnhours directory online. There is no cost to join, Walton said, since the local businesses and people are the money. “At a very fundamental level, it's completely changing the paradigm of what money really is,” he said. Similar networks are already in place across the country, Walton said. Durango has Durango Hours, and there's a new system sprouting up in Denver. Ithaca, New York has successfully used its local currency, Ithaca Hours, for 20 years. One of Walton's fellow Mountain Hours founders recently used Summit's new notes in the college town. And that's the idea, Walton said — eventually, hopefully, hours will be traded more frequently throughout different areas in the country. Stacey Matzke, owner of Altitude Mobile Windshield Repair, signed up because national money is in short supply. So far, she's used the currency in Dillon at a pizza shop and thrift store, and her children accepted the hours at a lemonade stand. Matzke likes that the money stays locally. What Really Happened on 9/11? ?